This? Is the 100th post here at Breaking Up with Captain Crunch. I cannot believe we're hitting triple digits here! I feel like I should bake a gluten-free cake or something. 'Cept I already made - and ate - cupcakes this week. So I guess it's imaginary gluten-free cake for us. Either way. 1. This week, I have discovered the following things are gluten free: Tootsie Rolls (as well as most other candy by the Tootsie company), Honest brand teas and lemonades, Swiss Miss hot cocoa mix, Pillsbury chocolate icing and (allegedly) the popcorn at AMC theaters. Healthy, not so much. But gluten-free. And also delicious. 2. I was working up a big post about my 10-year high school reunion last Saturday, but decided it didn't really matter. Drank some Woodchuck, saw some familiar faces, closed out another chapter. Here's some gratuitous photo-ness of 16-year-old me though, just to remind us all that we've come so far. 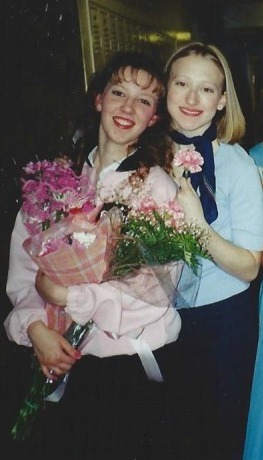 Me, in the pink, after a performance of Grease. I was a bit of a theater nerd.